“Don’t be absurd,” Louisa chided. He was the youngest charge she had ever taught, selected for his promise, but he expected everything to come so easily. Millenials, she thought. “Here, I’ll do one. Pay attention.” She lifted her hands and made her movements more deliberate and graceful, exaggerated for effect, to select a young man she had eyed for weeks. And what perfect timing, she thought as she peered in on him. He was on the computer, playing one of his video games. “Why him?” Ebenezer asked with some disdain and Louisa bit her tongue. The young charges only ever wanted to match the young, beautiful people with each other. It was far too easy and not nearly as rewarding. Ebenezer, to his credit, clammed up and watched her with interest and she used her hands to guide the scene. She kept one hand on him firmly and, with the other hand, went seeking for his counterpart. It took longer than either of them would like but this young man was a tricky case and Louisa was determined to do it correctly. She could’ve done what the other mentors did in these instances, she thought, and zip off to Los Angeles and select two cat-eyed actors who happened to be on the same set; but it was all flash, just for show. She wanted her charges to do work that mattered, that lasted. 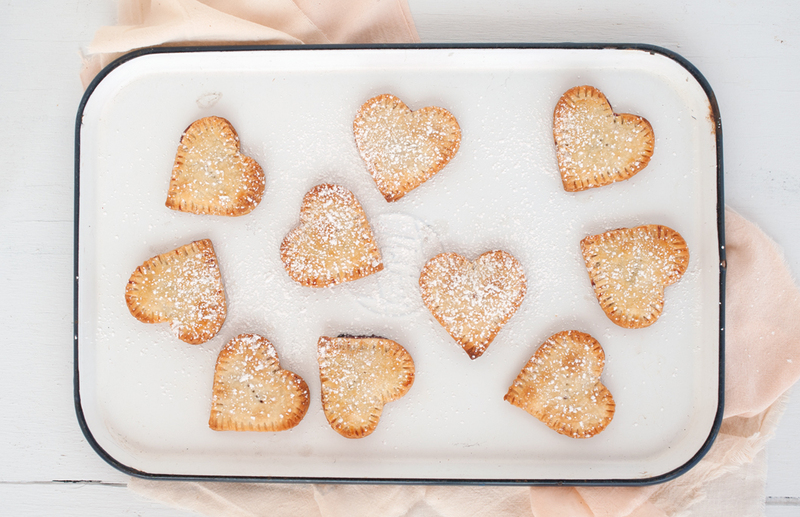 How fitting that these little heart-shaped pies should come with a dusting of powdered sugar. It’s snowing as I write this (when isn’t it snowing?) It’s dinner time. Nigella Lawson is talking somewhere in my apartment, like some kind of good British fairy, there to dispense guidance or a cheeky wink if I need it. When I finish writing, I have more work to do, for a few hours yet, but I strangely don’t feel tired or bothered by the thought. I’ve known that these next few weeks were going to be heady with work and stress and things due and now that “the weeks” are here, I feel prepared. I’ve been playing a little game lately- something that makes me feel a little goofy and New Agey but whatever, it makes me feel better and it works. Pollyanna was on to something with The Glad Game. I’ve been playing The Gratitude Game (god, SO NEW AGEY) where you basically start slowly listing the things you’re grateful for. Here’s what’s funny about the game- no matter where or how slowly you start, you can play it for hours. Gratitude, I discovered on Monday, riding on the LIRR into Manhattan for a meeting, my nerves jumbling, splits like atoms. Touch one thing to be grateful for and you can uncover fifteen other things to be grateful for, some of them as minute and trifling as being grateful for being on a warm train on a brutally cold day and then looking out the window and spotting an old man on a bench, his jacket unzipped, his hands uncovered and raw in the cold and making a wish that he’d zip up his jacket and then whoosh, a rush of joy as he does zip his coat against the cold, as if he can hear you, as if your feelings have wings. It’s a silent game, it’s yours, and the benefits are endless. Nobody has to know how silly it makes you feel at first. If you’re struggling right now, I think you should try it. 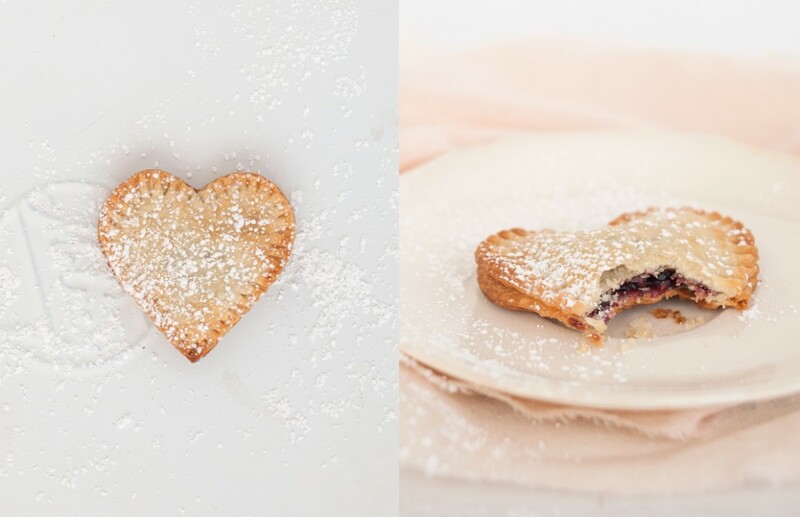 We were not supposed to make these cute little heart pies. We were supposed to make something more complicated (more charming yes but more complicated) but found ourselves struggling with the ingredients list. Nicole (as snowed-in and bowled-over as I feel) went with these simple loves instead. They use store-bought ingredients, yes, but that just means… you can make them today, no stress, no worries. 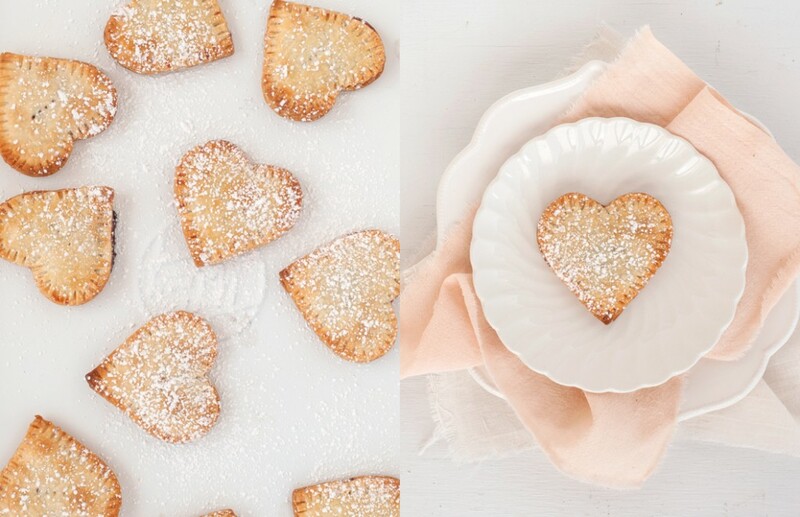 A simple, breathlessly easy gesture of love for Valentine’s Day; doesn’t that sound just… right? *It’s true, these are filled with jam not chocolate despite our promises for a chocolate-filled month. But why not chocolate? Make them with Nutella and then please invite me over so I can eat one. Okay, thanks, glad we agree. 1. Roll out pie crust to 1/4 inch thickness. 3. Spread jam in the center of half the pies, leaving some room around the border. 4. 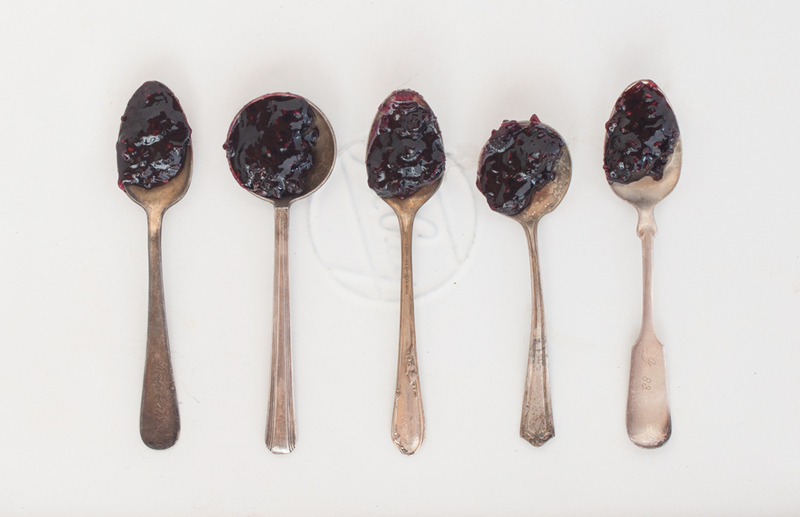 Combine blank halves with jam halves and use a fork around the border to seal. 5. Whisk egg lightly and brush over tops of the pies. 6. Prick top lightly with a fork. 7. Bake in oven (follow pie crust instructions). 8. 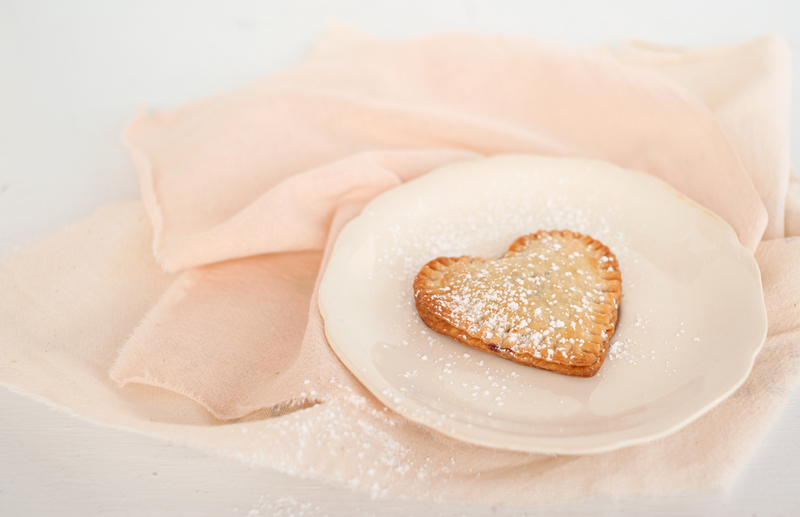 Once the heart pies are cool, dust with powdered sugar. These are totally fabulous. Love the jam in the middle!